Science Building takes center ..
MTSU Lady Raiders star hits ma..
A new exhibit showcasing photos from six decades of country music captured by the lenses of three distinguished photographers is underway through April 17 in MTSU’s nationally renowned Baldwin Photographic Gallery. These are only three of the classic photos featured in “Images of Country,” the new exhibit at MTSU’s Baldwin Photographic Gallery, which runs through April 17. “Images of Country,” which features the work of Harold Baldwin, Jim McGuire and Russ Harrington, is on display in the Baldwin Gallery’s new quarters on the second floor of the Bragg Mass Communication Building on campus. Baldwin established the photography program at MTSU in 1959 and established the photo gallery five years later, donated $100,000 in 2012 to sustain the gallery that bears his name. It reopened in January with a gala 50th anniversary celebration featuring a lecture and exhibit by photographic artists Jerry Uelsmann and Maggie Taylor. A celebrated photographer in his own right, Baldwin’s work in this exhibit were shot backstage at the Grand Ole Opry between 1969 and 1971. His complete Grand Ole Opry collection is housed in MTSU’s Center for Popular Music, which is located downstairs from the gallery. You can learn more about the collection at http://popmusic.mtsu.edu/archives/inventory/baldwin.htm. McGuire learned how to use a camera in Vietnam in the Air Force in 1964 and later began shooting bluegrass music festivals in Northern Virginia, which led to shooting album covers. McGuire has spent the last 40-plus years in Nashville in a small storefront studio, shooting album covers for major labels and big stars like Marty Robbins, Barbara Mandrell, Waylon Jennings and Bill Monroe. His body of black-and-white images of musicians is now known as “The Nashville Portraits”; you can learn more about them at his website, www.nashvilleportraits.com. 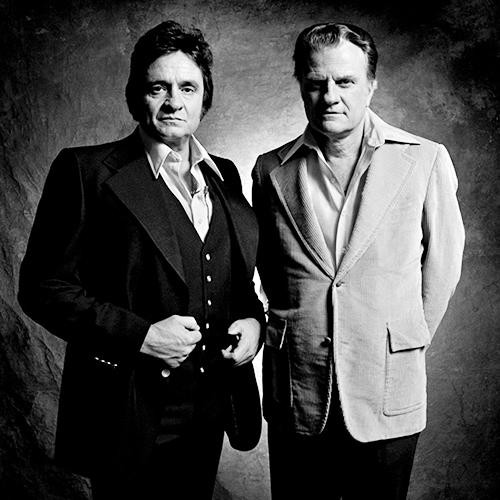 Harrington, who studied photography with Baldwin at MTSU, established a photography practice in Nashville and has captured revealing images of the world’s most-photographed musicians and performers, including Loretta Lynn and Jack White, Robert Plant and Alison Krauss, and Brad Paisley. His portfolio features a who’s who of the music business, including Taylor Swift, Keith Urban, Al Green, Tim McGraw, Mary Chapin Carpenter, Dolly Parton and Reba McEntire. You can learn more about Harrington’s work by visiting his website, www.russharrington.com. The “Images of Country” exhibit is free and open to the public; a searchable campus map with parking details is available at http://tinyurl.com/MTSUParkingMap13-14. The Baldwin Photo Gallery is open 8:30 a.m. to 4:30 p.m. weekdays while classes are in session at MTSU. The public can schedule a visit by contacting MTSU photography professor Tom Jimison, who has curated the gallery since 1991, at tom.jimison@mtsu.edu. You can learn more about the Baldwin Gallery at its new website, http://baldwinphotogallery.com.